Tis the season to be lazy fa la la la la la la…While I wish I was just kidding in opening up the post this way, it is unfortunately the tune that people tend to sing this season. The cold, short days decrease the body’s production of many hormones associated with elevated mood, elevated energy and metabolism, and motivation to get to the gym and eat healthy. Therefore, have a plan and stick to the plan. Fight those holiday lazy low energy moods by getting to the gym rain or shine! 1)	Choose a ten-minute workout routine and perhaps do two rounds of ten minutes through different parts of the day if you can’t commit to one big block of time. There is plenty of evidence that a 10 minute HIIT workout is very effective and promotes the same physiological response as it would for a longer workout. So short bursts are better than none. See the program below. b. See who can walk the most miles in a week using a pedometer. About 2,000 steps equals one mile. Remember that movement is just as important as working out. c.	Share moments of truth with each other, or highlights from your day to help keep your mind positive. d.	Keep a donation jar handy in each household; if any of you consume an unhealthy food item, you toss in a quarter. The person with the most quarters in the jar has to treat the other person to dinner at the end of the month. Make it a fun month of self evolution and re-centering for the decisions you make about your life are completely within reach. As promised, below is a 10-minute-high-intensity blast. The high intensity part includes the jumping rope. Get clearance from your doctor before jumping rope. 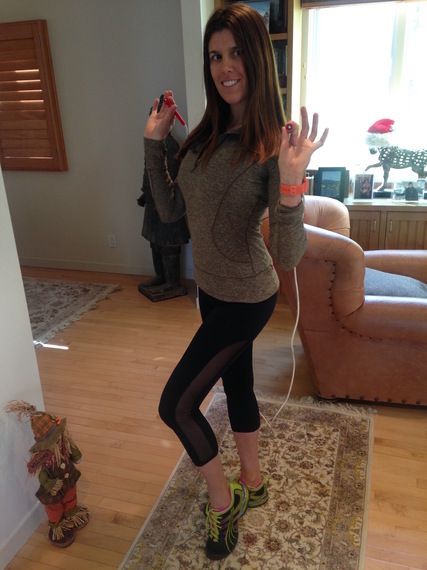 If you cannot jump rope, simply step side to side, do jumping jacks or power walk for 1 minute intervals. For the exercises, you will do a set of 10 reps of one exercise in between the cardio. If for whatever reason you cannot do one of these exercises, simply repeat an exercise you can do. The goal is to move for 10 straight minutes with 10-20 seconds recoveries in between each exercise and round of jumping rope. Starting in plank position with your hands a bit wider than your shoulders, and remain on the ball mounts of your feet. Slightly tilt your pelvis back so that your hips square out to the ground. Keep your abdomen engaged. As you lower to the ground, keep your hips in the same plane as your chest. Avoid dipping the hips first. Keep your neck in alignment with your upper back. Exhale the breath to come back up. For video demonstration click HERE. Starting in a side plank with your shoulder directly over your wrist and on the knife edge of your bottom foot, stabilize. Keep your spine neutral, along with your neck. Energy the bottom hand as to pull the shoulder down away from the ear. Activate the lats. Then, slowly elevate the top leg to go forward and back. You always have the option of dropping the lower leg for more balance. For video demonstration click HERE. This is one of my favorite yoga moves. 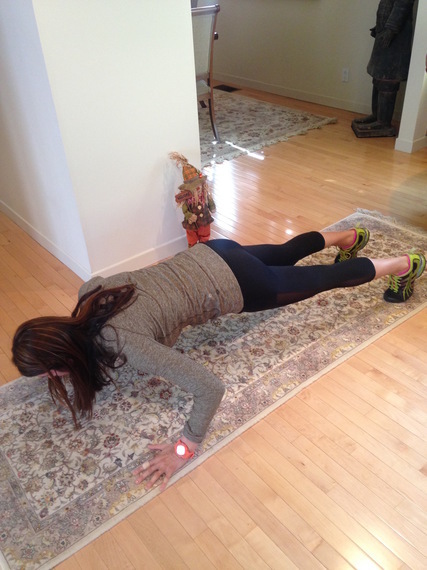 You can make it more challenging by using light dumbbells. The weight of your arms may be just enough. Make sure the legs are strong and isometrically held. You want the knees to touch, however if you have weak or tight hips, it might be more comfortable to have your feet hip distanced apart. When you go into shoulder flexion (arms over head) relax your shoulders and avoid arching your lower back. When you go into shoulder extension (arms back) point your palms to the ground and get the shoulder blades to squeeze in and down. For video demonstration click HERE. 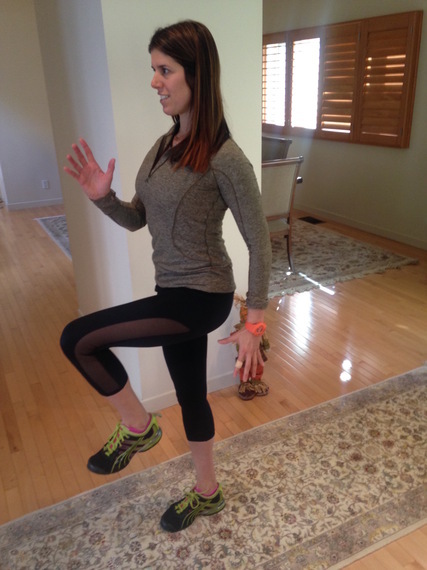 Starting with one foot forward and one foot back, be sure to stabilize through both feet, keeping your hips neutral and your tailbone slightly tucked. Align your spine with your ears to track over your shoulders. Using your arms, drive your back leg forward and bring your knee up in alignment with your hip. Avoid tilting your hip up with the knee up. Then slowly step the foot back and watch both hips remain parallel to the ground. Repeat. Keep your entire body aligned through this dynamic movement. Take your time and find a tempo that works. For video demonstration click HERE. 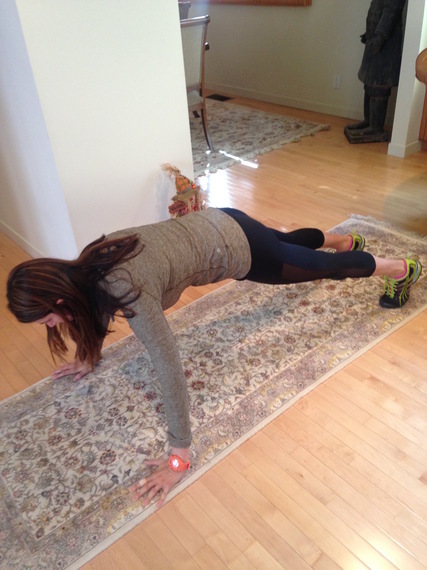 Starting in plank position on your hands and ball of the feet, draw your shoulders down as if the floor was slippery and your hands and feet are gripping the floor for stability. Activate the core muscles and breathe. Once you feel like your muscles are all engaged, tap your chest with your right hand, then your left. Then reach back to down dog and tap your left ankle with your right hand, and then your right ankle with your left hand. 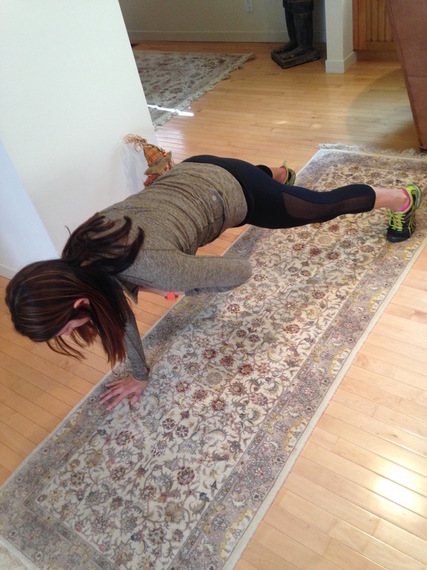 In between the ankle taps, return to a plank. Take your time with these and get the deep stretch while you work the muscles of the core. For video demonstration click HERE.